Seen in a vacuum, Land of the Dead is just another gory zombie movie. It doesn’t have much to recommend it except for some good casting: Dennis Hopper as a slimy, Enronesque capitalist and John Leguizamo as a streetwise zombie hunter. Fans of gore won’t be disappointed (my audience erupted in applause when Tom Savini, king of splatter films, made his cameo), but the average moviegoer could pass it by. But this is not just any zombie movie. It’s the fourth installment in George A. Romero’s “living dead” series. For those who don’t recognize the name, Romero started this thing back in 1968 with Night of the Living Dead. Since then there have been sequels, ripoffs, parodies, remakes, and most recently, homages. So as a genuine Romero, Land of the Dead deserves a little more attention and thought. There are cameos by Tom Savini, Shaun of the Dead actor and director Simon Pegg and Edgar Wright. First some history: back in the beginning, the recently dead started coming back to life and eating the flesh of the living. Those who got bitten also turned into zombies, and the plague spread. Pockets of humanity fled first to the malls (Dawn of the Dead), then underground (Day of the Dead). Now, a group of Americans gather where three rivers meet (Pittsburgh? ), forming a natural boundary between human and undead. Our protagonists are a team of raiders who drive out into the surrounding towns scavenging for food and supplies. They drive a ridiculously armored vehicle called Dead Reckoning. It’s an armored bus with missile launchers, machine guns, fireworks launchers (to distract the “walkers”), and video surveillance. The scenes of raiding could have been lifted straight from the Road Warrior movies, which is my first complaint. Romero’s zombie movies haven’t been about the action, but rather about the subtext, the social commentary, and human reaction to horror. Going for the cartoonish post-apocalyptic style detracts from much of the humanity of the earlier films. These scenes also illustrate another of my complaints about Land of the Dead, which is that there is too much dialogue. Instead of just carrying out their mission, these raiders spell out exactly what they plan to do. A good movie shows instead of tells. Back to the plot: Cholo (Leguizamo) plans to retire after tonight’s mission. He’s going to buy himself an apartment in the protected city (a skyscraper called “Fiddler’s Green”), where rich people enjoy their urban lives above the fear of the people on the street. But Kaufman (Hopper), who runs this utopia, is not an equal-opportunity housing provider. Even though Cholo has the money to buy an apartment, he’s not the right class of person. He’s just going to have to live at street level for now, says our corporate villain. Meanwhile, the zombies have started to remember their old lives. They are led by a deceased gas station attendant (credited as “Big Daddy”, played by Eugene Clark) who seems to have some inkling of how to pump gas, get into cars, and use tools. He has another new trick, too: he communicates with other zombies. (He doesn’t just scream, he says “Raaaar”). 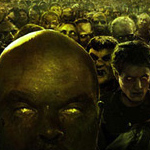 He gathers a group of zombie followers and marches (shambles?) them straight for the city. Back among the living, Cholo has anticipated Kaufman’s rejection, and is carrying out plan B: steal Dead Reckoning, drive out to a safe distance, and launch missiles at Fiddler’s Green. Kaufman sends Riley (Simon Baker), the generic, blonde leader of the raiders, to try to stop Leguizamo. And while Riley’s sympathy lies more with Cholo than Kaufman, he’d prefer not to see innocent people get shelled. Through it all there is much carnage as our characters shoot, bash, and chop their way through hordes of zombies. Night of the Living Dead, from 1968, has a black actor leading half a dozen white survivors. And even though the living dead are at their doorstep, they bicker over racial issues. Dawn of the Dead, from 1978, has humanity holing up in a shopping mall. When the going gets tough, the tough go shopping. Day of the Dead, from 1985, has scientists and the military conducting experiments on the zombies. They’re not so interested in understanding the terror, but in manipulating it for their own ends. Land of the Dead has a lot to say about our times. The horror is still “out there,” but one of the worst villains is a CEO who profits from the misery of the rest of us. The movie also has a character who is willing to destroy a skyscraper, including some innocent people, because it represents everything that is wrong with America. The characters’ reaction to the zombie horror is practically indifference; it is a fact of life they have come to live with. In fact, some of the survivors realize they have more in common with the zombies than they do with humanity. On reflection, Land of the Dead is a worthy installment in Romero’s “living dead” series. It is a must-see for fans of Romero and for anyone who appreciates the subtext in his zombie pictures. But for the casual moviegoer, the cartoonish characters, the overwritten dialogue, and the sheer amount of zombie carnage might not merit a trip to the theater.